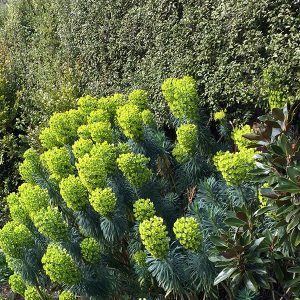 One of the widely grown species Euphorbia wulfenii is a tall evergreen perennial that is well suited to dry areas especially those with mild winters where the year round colour is appreciated. This is an evergreen variety, it will flower from late winter into spring and adds both height and colour to the garden border. Commonly called the ‘Mediterranean Spurge’ and as it is so widely grown simply the green Euphorbia. Reaching around 1m in height Euphorbia characias ssp. wulfenii is grown both for the foliage and the large flower heads that appear in late winter. Brilliant green flowers that appear above attractive deeper green foliage are actually large flower bracts, and combined with the foliage make this a very useful landscaping plant. 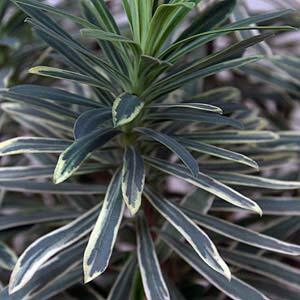 A few different cultivars are available including Euphorbia ‘Silver Swan’ (see picture right) with its attractive variegated foliage. An excellent architectural plant for a container in a sunny courtyard. Euphorbia wulfenii ‘Shorty’ is generally a lower growing cultivar as the name suggests, green foliage and yellow flowers. ‘Humpty Dumpty’ is even smaller growing cultivar, not available in Australia as far as we know. This is a tough plant originally from a Mediterranean climate and well suited to Australian conditions. Full sun to a little afternoon shade. Water when dry through the first summer. Flowering time – Late winter to spring depending on the climate. Prune back to the ground after flowering. Wear gloves to avoid irritation from sap. Euphorbia wulfenii is best with a reasonably hard pruning after flowering. This will ensure a compact bushy growth and a healthy plant. You can prune the spent flower heads back as low as you can, use protection for hands and arms as the sap is irritating to the skin. As with all euphorbias take care when pruning as the white milky sap is a skin and eye irritants, wear protective clothing and wash hands well after pruning. Easily propagated from cuttings or by division of established clumps. Cuttings can be taken in spring, and planted directly into a free draining potting mix. Division is best in spring.